The economic predicament has been building up over the last decade. When peace was signed in 2005, what became the autonomous region of southern Sudan was for all practical purposes a subsistent economy. In the following years the sole source of government revenues came from oil production. The result was an undiversified consumption economy based on import of goods and labour. Neighbouring countries and many of their entrepreneuring citizens have been the main benefactors of this economy. Oil production was shut down in January 2012 and overnight the government of South Sudan was robbed of practically all its income. It was left with the challenge of paying salaries to a bloated army and bureaucracy. The government solved this dilemma by cutting cost, withholding salaries and borrowing against future revenues. Production was resumed in early 2013, but then, due to damaged equipment, at about 30% of previous rate. The outbreak of a new civil war further reduced oil pumping and imposed additional economic strains on government spending. The last nail in the coffin for South Sudan’s economy was the dramatic fall in oil prices in the autumn of 2014. South Sudanese oil is of sub-standard quality in the first place and fetches a lower price at the international market. Adding hurt to injury, Sudan levies a relatively high fixed fee for the use of oil transportation infrastructure. South Sudan is currently left with a few dollars per barrel of oil exported. Sources close to the government indicate that it has exhausted every potential source of borrowing from abroad. An alleged loan of USD 500 million from Qatar National Bank is either held up by practical or legal obstacles, or supposedly earmarked for agricultural development and would not contribute to stem the escalating crisis. The government faces two fundamental problems: inadequate payment of salaries and other benefits to government employees, and a massive trade deficit which has created a foreign currency crisis. Hyperinflation is in progress. 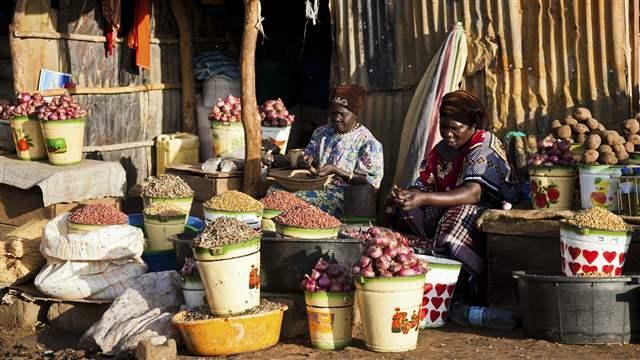 The price of basic food stuff in the market has supposedly doubled over the last month (Juba Monitor, 23.04.15). Traders cannot exchange their accumulated SSP into foreign currency and are unable to replenish their stocks of trade goods. Stop in payment of salaries combined with galloping inflation reduce the purchasing power of the urban population to practically zero. This initially creates manageable resentment, but instability ensues when people in uniform – soldiers, police, prison wardens and game keepers – feel the bite of the economic crisis. The economy is the whirlpool that threatens to pull South Sudan under. The first step to end the economic crisis is a peace settlement and normalisation. But, the IGAD negotiation process appears to be dead in the water and with no compromise in sight. For sure, a drowning South Sudan put pressure not only on the warring parties, but also the neighbouring countries and the interested parties further afield. The crisis might generate enough momentum for Juba and SPLM-IO to reach a compromise, but it just as well force external parties to supplement the negotiation frameworks with other measures. One possibility is to give the Government of South Sudan soft loans to get over the crisis. Another is a “Plan B”. But neighbouring countries appear to have no appetite for external military intervention and it will be difficult to condone any seizure of power by forces inside South Sudan. The answer to these dilemmas will come soon, meanwhile we are watching an accident in slow motion.